The blog is a constant source of joy, not least because it’s led me to meet some lovely people: other bloggers, chefs and restaurateurs who have been willing to let me interview them (click here), owners of food shops and cafes, and today two other people who are as enthusiastic about Italy and Italian food as me. William Goodacre founded Tastes of Italy (click here) in 2000, specialising in cookery and wine tours; Dorcas Jamieson handles their PR. Dorcas got in touch to suggest we all meet, telling me that William was a ‘font of knowledge’ about Italy and Italian food. How better to spend nearly two hours on a Friday morning than talking about Italy and food, and especially Venice and Venetian food, over coffee. I had a great time and was surprised and so pleased when William gave me a gift at the end of a small panettone and a pandoro from Cova, one of Milan’s oldest pasticcerie. Cova opened in 1817 next door to the famous Teatro alla Scala and Giuseppe Verdi was a regular patron. 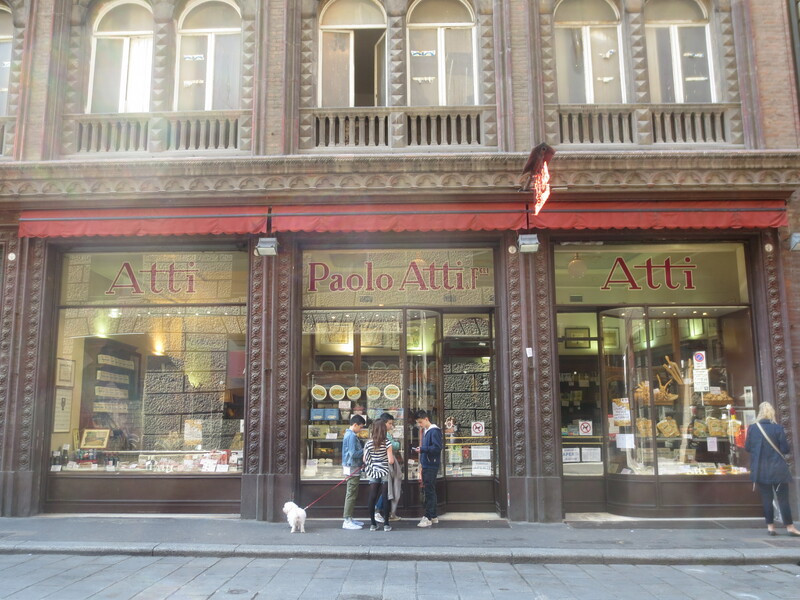 After World War II, when the building was bombed, the shop moved to via Monte Napoleone. It was William’s idea that I might write about some Italian breads popular at Christmas. We’re all familiar here now with panettone – every supermarket seems to have some – but this is just one of Italy’s popular celebration breads. We’d talked a lot about the differences between each region of Italy, from the people to their food. A food with the same name – pizza being the most obvious example – can vary enormously from one region to another: the thin, crispy pizza dough of the Romans compared to the thick, soft dough of the Neapolitans. Special breads also vary from the soft, light panettone of Milan to the heavy, rich panforte of Siena in Tuscany. You might say a panforte is hardly a bread – but all the breads/cakes I’m going to talk about here stem from the Italian word ‘pane‘ – bread: panettone, pandoro, panforte, pangiallo, panpepato, panspeziale and pandolce. This is the Italian Christmas bread we are most familiar with in UK. Originating in Milan, it is a brioche-type soft sweet bread filled with candied fruit and peel (although other versions, especially chocolate, are also found nowadays). Panettone was a favourite of Verdi’s wife who liked to eat it warm, straight from the oven, at Cova. Their recipe is a jealously guarded secret but is basically flour, yeast, sugar, butter, eggs and candied fruit. Their website (click here) gives useful information about the best way to keep your panettone: in a warm dry place (cold and damp will harden it), and they recommend warming it on a radiator or before a fire for half an hour before eating it to bring out its full fragrance. For many years now, it has been a tradition for my family to eat panettone – with good coffee, of course – for breakfast on Christmas Day while we open presents and there are always carols playing in the background. It therefore has a special and happy significance for me. (Which reminds me, I must go and buy that panettone!) 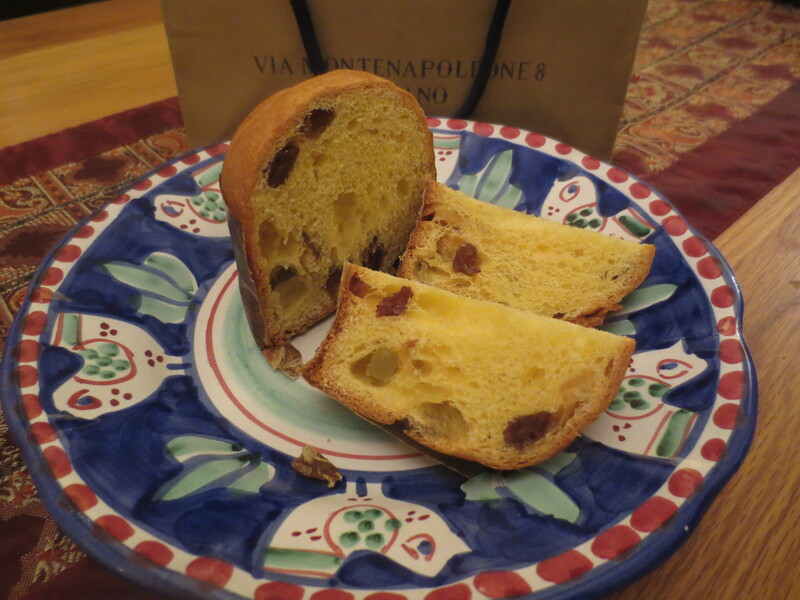 When I tried the panettone from Cova that William gave me it was particularly delicious: beautifully fragrant and moist. This is another classic Italian Christmas cake. Made with flour, yeast, sugar, butter, cocoa butter and eggs, it is golden in colour (hence its name: pane – bread; d’ – of; oro – gold) and icing sugar is sprinkled over it just before serving. 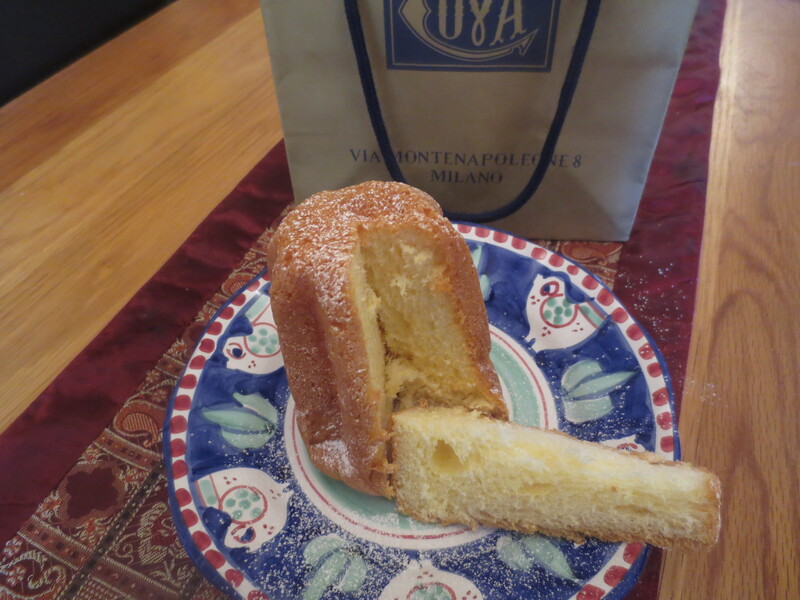 The pandoro from Cova that William gave me came with its own little packet of icing sugar! Cova say it can be eaten at any time of day and recommend that it makes a delicious dessert served with mascarpone cheese. It’s baked as a tall cone shape with 8 ridges that give the appearance of a star at the base. Pandoro originally came from Verona and a recipe for it was patented in 1894. However, it dates back much further to the Middle Ages when only the rich could afford to eat sweet breads – thus the ‘gold’ name has another meaning: you needed ‘gold’ to buy it! Panforte is a dense, heavy cake filled with fruits, nuts and spices and a speciality of Siena in Tuscany. I remember my first experience of eating this was in my early twenties when my boss at the time (an editor at Methuen) brought some back from Siena for me; he’d bought a villa there and also brought back a bottle of the first extra virgin olive oil I ever tasted. I remember being quite startled by its green colour. But then this was the boss who got me editing and commissioning cookery books so he knew of my love of food and cooking. Panforte goes back to Medieval times and records from 1205 show it being paid to nuns and monks at a monastery as a tithe (tax). Antonio Carluccio in his recipe for it in his Italia book says it came via the port of Pisa with the introduction of new spices that arrived from afar. Pangiallo means literally yellow bread: pan – bread, and giallo – yellow. It’s a rich fruit cake made with raisins, nuts and spices that comes from the Lazio region of Italy, where Rome is situated. It dates from the imperial era of Ancient Rome and was handed out at the time of the Winter Solstice – just before Christmas – in order to encourage the sun to return and has a thin layer of golden crust to represent the sun. This is similar to panforte but a kind of gingerbread cake with the addition of black pepper (pan – bread; pepe – pepper) and honey and sometimes chocolate. It comes from the province of Ferrara in Emilia-Romagna, dating back to the 15th century, although it probably originated earlier in Siena as a predecessor of panforte. … contains honey, candied fruit, stewed fruit, jam or fruit pickles, shelled almonds, pine nuts, cocoa powder, dark chocolate and wine syrup. Some recipes use more spices – as you’d expect from the name – maybe cinnamon, cloves and star anise. This sweet bread (pan – bread; dolce – sweet) is made from raisins, pine nuts and candied fruit and comes from Genoa, capital of the Liguria region that is in the western most part of northern Italy, bordering France. Dating from the 16th century, this Italian Christmas cake most closely resembles our own and there is a tradition of making ‘Genoa Cake’ in UK, but an important and vital difference is the use of yeast as a rising agent in pandolce rather than baking powder, and thus the ‘dough’ must be left to rise like bread. I’ve had great fun looking at these Italian Christmas breads and cakes and offer a big thanks to William for the idea for this post. 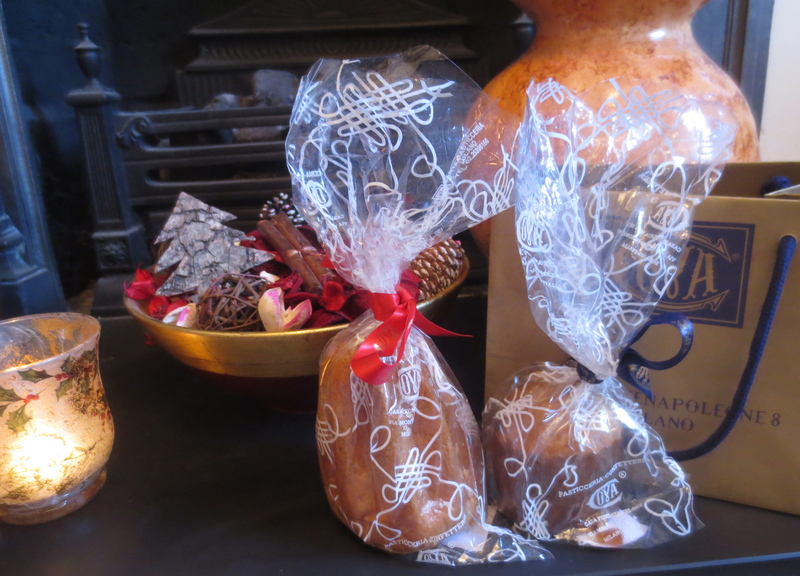 There are other special Italian sweet breads, of course, but these are ones particularly popular at Christmas. The first three – panettone, pandoro and panforte – are the ones most easily found in UK. Maybe if you venture into somewhere like Soho in London where there are specialist Italian stores, you might find others. 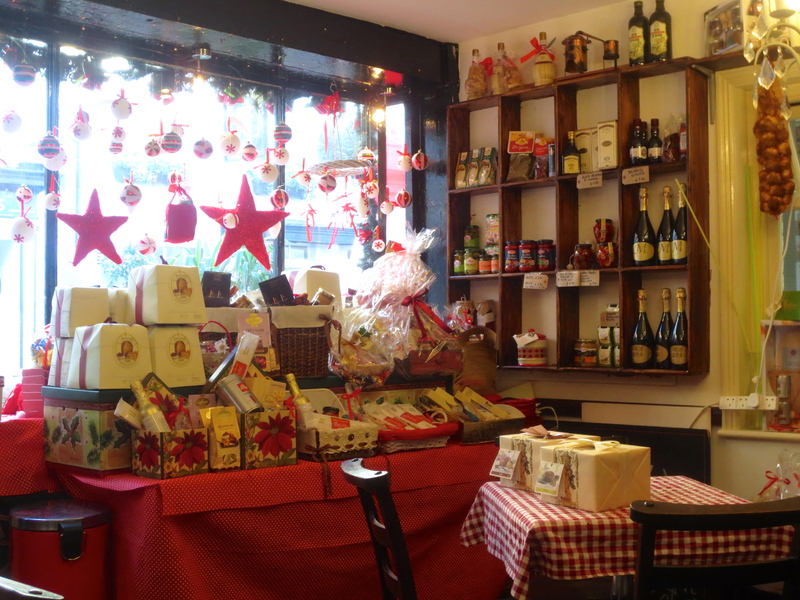 Locally, I ventured down to Corto Italian Deli in Church Street, Twickenham this morning to talk to Romina and took some photos of their Christmas display. 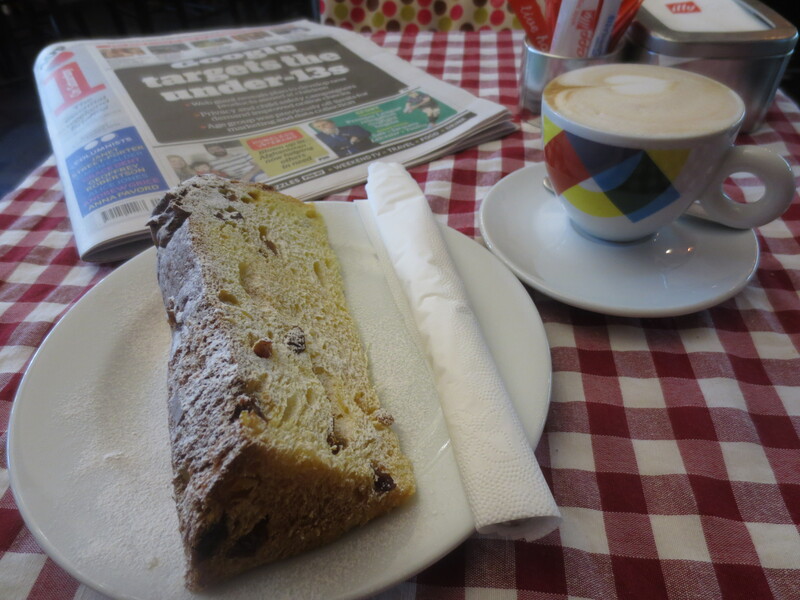 And, of course, I had to stop and have a cappuccino and a slice of panettone! Good idea. Grazie mille 🙂 I’m a bit traditional and like classic panettone but usually buy a small chocolate one for my daughter-in-law who doesn’t like raisins. I think she would love pandoro! Italian bread for the festivities? Don’t mind if I do, thank you. Many thanks, John; very kind. Was fun doing the post. A very happy Christmas to you and Heather.